In Basketball Nightmare you're the captain of a high school basketball team. One night you have a very strange dream, and the dream is what is played out in this game. You're teamed up against various characters from the dream such as wolves, weird turtle things, small one-eyed dudes and old men. An interesting opening on a traditional theme. The gameplay is excellent, Basketball Nightmare runs smoothly and is quite reasonably paced. Not slow or lagging whatsoever. Although sometimes during the game ridiculous fouls will be called for no apparent reason but this is only on rare occasions. Other than that the movement on the field, the shooting, and of course the dunks are quite easy to perform ensuring high scores and a faster pace of play. It's one thing to create a different sports game, but it's another to do it well. The graphics in this game are quite good although at times there are sometimes problems with flashing players on the court. However, the excellent cut scenes when dunks are performed more than compensate for this. The courts are nice and change regularly, and this is good since you don't play on the same court over and over. Very nice overall. 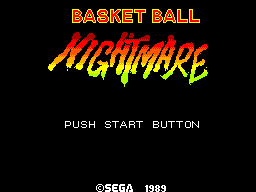 The title theme and game sounds in Basketball Nightmare are quite good although during game play the music can get a bit repetitive at times. Still they're very well done and fitting. The controls in this game are sometimes a bit questionable. There were a few occasions, when traveling on diagonals, where it was difficult to get back to a straight direction. But, other than this minor flaw it runs quite smoothly and you should have no problem putting it in and jumping right into the game. 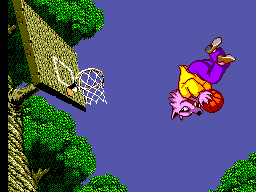 Basketbal Nightmare has a huge amount of replay value. You can aim to beat the game within different time limits to allow for higher scores and more scoring opportunities. 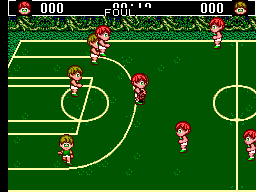 Also, the two player option is always a positive thing in any game, especially a sports title. Here it is welcome and a nice edition, though expected. Basketball Nightmare is a really good game. It has great graphics, sound and gameplay. These features make it a lot of fun but the thing that makes it even better is the two player option, opening up hours of competitive action.